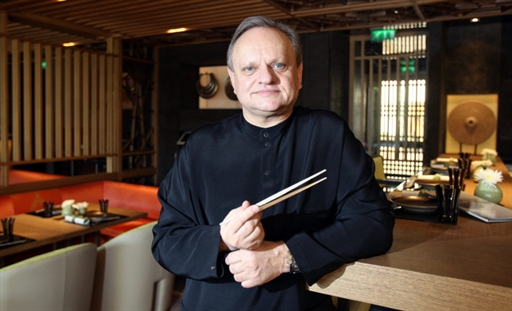 Joël Robuchon is a cooking mandarin, one of those legendary French chefs known around the globe, and with good reason. He’s been around for over 50 years now – and is still able to re-invent himself and his style over and over again. If his website is a bit slow, the reason might not only be the heavy flash-applications but the fact that there are so many things to tell. Robuchon runs restaurants in Paris and Tokyo, in Monaco and Las Vegas, in New York, London and Hong Kong. He’s a regular in Macao, the casino island off Hong Kong, too. In 2001 he became a real venture capitalist over there when he set up shop in the legendary Hotel Lisboa when the Chinese boom was only in its very early days. His Atelier in Paris has re-invented high class French cooking by giving it a less high-brow and more accessible twist (we will come to that later), and this also describes the whole man: food lovers all over France still remember his fairly old-fashioned TV appearances, when he presented young talents and other great colleagues from the various French regions (Ducasse still wore a beard when cooking with him on the show). They turned TV into a real cooking university, preparing all the French classics publicly, step by step, explaining products, spices, recipes, with Robuchon not acting like a professor but like the nice old uncle Joel, always humble, always serving. His CV reads like a classic success story: back in 1960, at the age of 15, he joined the Relais de Poitiers as an apprentice, in 1974 he was offered his first chef’s position in Hôtel Concorde Lafayette. Two years later, he was decorated as a Meilleur Ouvrier de France, changed posts, and in 1981 he finally founded his first own restaurant Jamin. ...times changed. Not for the worse, no, but after the turn of the millenium many French chefs wanted to modernize in a way other than Michelin’s. Like his other great colleague Alain Senderens, Robuchon refused to be judged by the stiff Michelin criteria, he was seeking a new approach. No more crystal glasses, no more noble linen, no more silverware, no more stars – instead: a new concentration on good products, on a clear-cut, tasty cuisine that is not afraid of using cheap mackerels instead of luxurious turbot, that experiments with Asian flavours, that generally turns the heavy French gastronomic meal into a leaner, nicer, better thing. 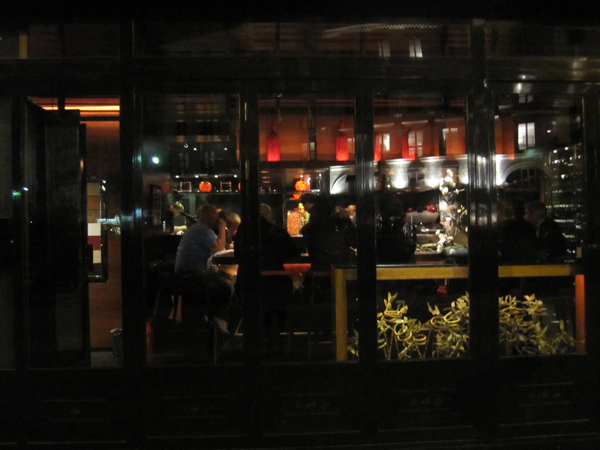 So here you are, sitting on high chairs at the bar of L’Atelier du Joël Robuchon in Saint-Germain. 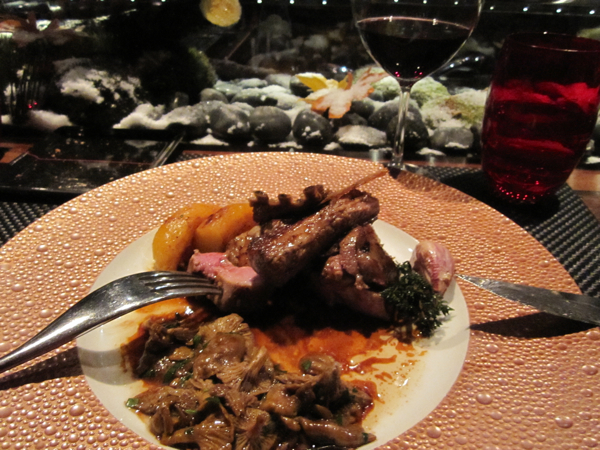 There’s Pierre Gagnaire’s Gaya just across the street and many tourist foodies sitting next to you. When we were there last time, a Japanese couple took photos of every plate rolling in, our companion to the left turned out to be the ambassador of Panama and to the right an American couple from Austin, Texas, celebrated their 7th wedding anniversary in jeans and t-shirts but, no kidding, with a bottle of Chassagne-Montrachet 1er cru. The times they are a’changing. This is not the company you’re looking for while in Paris? Well, get over it. And get over the fact that Robuchon’s Atelier is not a cosy place either. When you come at 18h30 – and that’s the only hour you can make reservations for, real dinner time works on a first-come-first-serve-basis – you can feel a bit stressed because the service people force you on the fast track (in order to clear the house before 20h30). That’s quite unusual in a Michelin two-star-restaurant (you see, the guide doesn’t care for Robuchon’s refusal) and, yes, it can even be annoying. But...there’s the food. 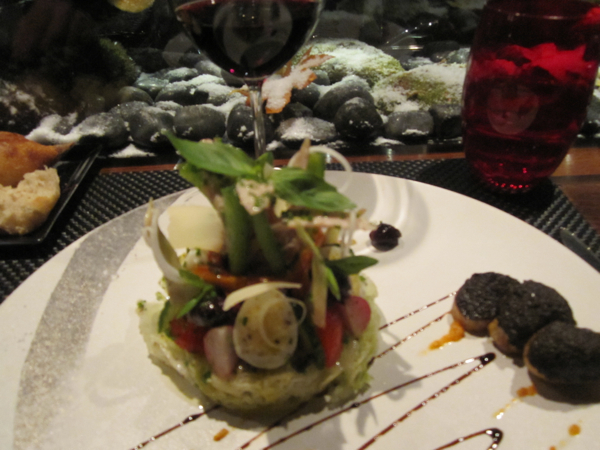 And the food, Robuchon’s food is a great, comforting experience, you’re in the hands of French master chefs. You can watch the rôtisseurs and garde-mangers and head chefs while eating. The bar you sit at is built around an open kitchen, it was one of the first of its kind in Paris. And what is prepared on that stage is brilliant. You can have a glittering Menu „Découverte“ which is 8 courses complete with scallops, foie gras, caviar, milk lamb for 150 Euros (200 US$), which is, in Paris, quite a bargain. A la carte there’s everything you could dream of, the full range of excellent French products is listed, the best fish, the best meat you can find on the markets, hand-picked by the Robuchon universe, it is a feast, believe me. They’re generous here, too, you get nice chunks of lamb or beef, portions are considerable, and they’re not stingy with truffles either (but beware: when we were there, the daily special, „Spaghetti aux Truffes Noires“, came at 120 Euros alone, a taste explosion that makes your bill explode too! And no way to see the price of the daily special...). L’Atelier de Joël Robuchon: it’s a gourmet’s must. 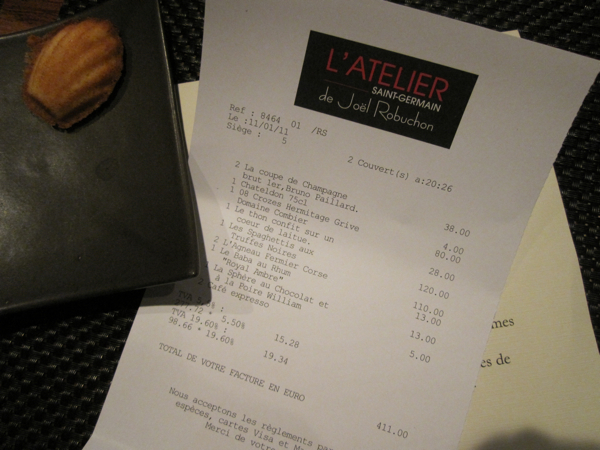 And since beginning of 2011 there has been a second venue on the Champs-Elysées called L'Atelier Joël Robuchon Etoile. 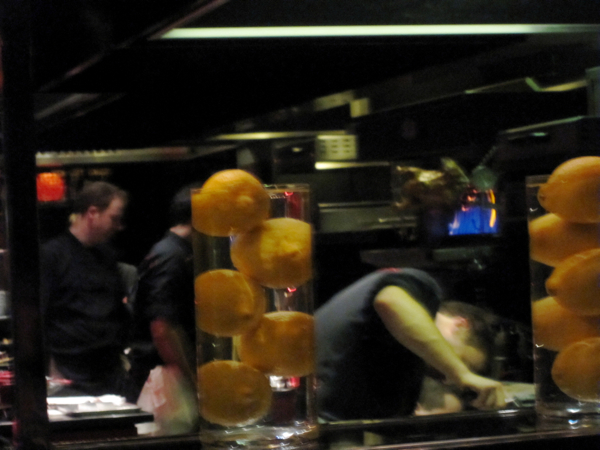 Robuchon, wherever he roams, certainly is one of the greatest chefs of chefs on the planet. Come and try it yourself! Just a Nicoise Salad? No, an experience!